Jo's Favorite Things: Holiday appetizers... Use those crescent rolls you bought on sale! Holiday appetizers... Use those crescent rolls you bought on sale! This is one of many recipes (many from Pillsbury) posted by various Skinny Fiber weight loss people. I must say that most of these recipes don't sound like anything you'd eat if you were really serious about losing pounds, but they sound good to eat. This one sounds great, particularly around the holidays with so many people doing so much entertaining! 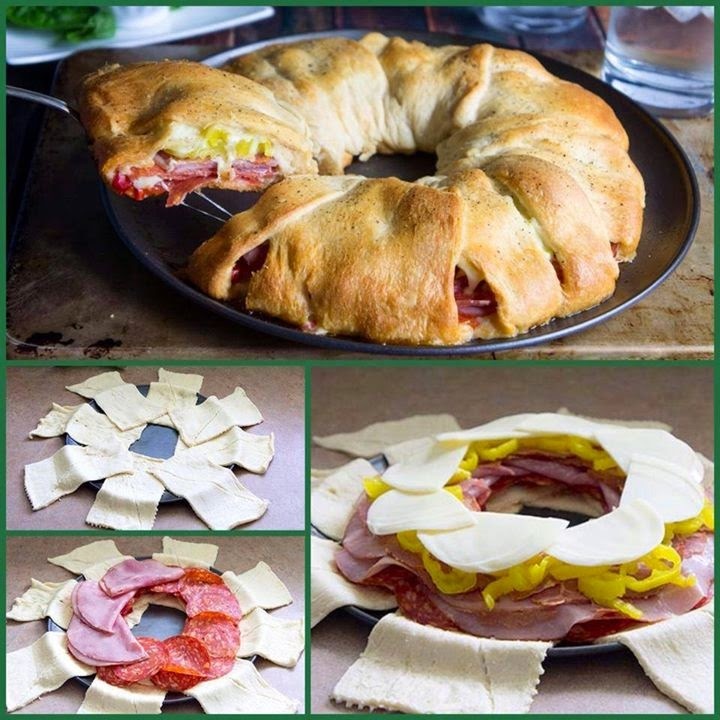 This crescent ring is loaded with all the delicious flavors of an Italian sub, great for serving at parties or during busy weeknights. Spread roasted red bell peppers towards center of ring on bottom halves of rectangles. Top with half of the cheese. Layer salami, ham and capocollo slices over cheese. Arrange pepper rings over top. Cover with remaining half of cheese. Bake 18 to 22 minutes or until dough is golden brown and thoroughly baked. Remove from oven; cool 5 to 10 minutes before cutting into serving slices. To drain the roasted red bell peppers thoroughly, use a fine mesh strainer, then set on a few paper towels to absorb any extra moisture. (Some have suggested using fresh green or red peppers as opposed to peppers from a jar. Olives and onions have also been suggested). "I made it for lots of hungry guys watching football, so I added way more meat. I even threw some pepperoni and turkey in there. I placed the peppers in between a the meats so it didn't make the bread soggy. I also added a spicy mustard. It was a huge hit! I can't wait to play around with different variations next time I make it.... Turkey cranberry Brie? Perhaps?" "I cooked mine at 325 for 20-25 mins and it turned out perfectly. I let it cool for about 10 minutes before cutting. It was cooked all the way through, not a mess and easy to eat." (A solution for some who complained about soggy crescent rolls:) "I just put mine back in the oven and cooked about 15 minutes longer after having this same problem (soggy rolls). I was thinking maybe cooking the crescents for about 5 minutes prior to placing the other ingredients? Worth a shot I guess." "There are so many things that you can do with it. You can do pizza flavor with fresh mozzarella, sundried tomatoes some pepperoni and a marinara sauce dip, you could do turkey and swiss with bacon and a dark mustard right on it with no dip...the possibilities are endless and it is inexpensive, quick and looks great...Thank you." "Marinara or ranch (sauce) would work. Also, you could slather the top with a garlic butter once it came out. Last, I would recommend putting some grey pompon on the inside prior to closing the ring." "Not a fan of Pepper Ring but will replace them with thin slices of tomatoes, a diced green pepper, diced dill pickles and some sliced black olives; and brush the crust with soften butter and sprinkle with grated Parmesan Cheese and Oregano. I think this recipe will be one that I will make using several different combos such as a Reuben or bacon, ham, turkey & Swiss! Possibilities are endless!!" "I will try this with bacon, cheese, eggs, and ham." "We did this last weekend with the Turkey, Stuffing, and Cranberry sauce. It was Good, Good, Good." "Great way to handle holiday leftovers. Just layer it in and yum. Our family enjoys a Swedish Smorgasbord Christmas Eve. I've layered leftover ham, fried potatoes, assorted cheeses and tiny Swedish meatballs." "I'm going to try it! But with fresh red peppers roasted in my oven lol and hot peppers from my farmers market." "Try adding a sprinkle of oregano, a little garlic, and some marinara sauce." "Brush the top and sides with a beaten egg so it browns up nice." "Just made it with pepperoni, dry salami, & ham w/ mozzarella. Delish!!" "It's good with roast beef, turkey, ham, Swiss, and grilled onions." "I have to add some Italian spices and olive oil." "Do same thing but use taco meat and make all the rolls point out." All of these comments? From the Pillsbury article itself and from here: 5,000 comments on Facebook can't be wrong!